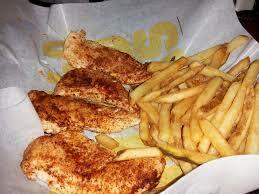 Our Boneless Wings are all white meat chicken. We didn't spend years perfecting our sauces and seasonings to put them on some sort of mystery meat. Authentically awesome and hall-of-fame bound. 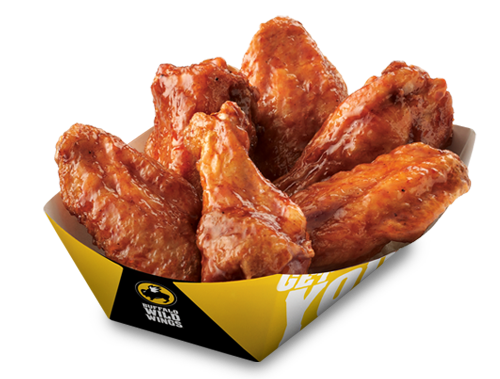 Award-winning Buffalo, New York-style wings spun fresh in your favorite Buffalo Wild Wings® sauce or dry seasoning. Take the checkered flag with this large flour tortilla stuffed with our juicy, grilled or crispy chicken, a blend of cheeses, lettuce, tomato and your favorite BUFFALO WILD WINGS® sauce or dry seasoning. Crispy chicken Buffalo Tenders™ topped with our signature Medium™ sauce, ranch dressing, lettuce, tomato and a blend of cheeses. 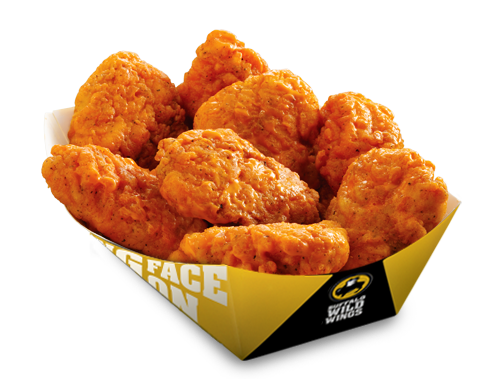 Ultimate nachos, beer-battered onion rings, mozzarella sticks and wings spun in your favorite BUFFALO WILD WINGS sauce or dry seasoning. Served with marinara sauce, our southwestern ranch dressing, and your choice of blue cheese or ranch dressing. This rich, cheesy classic is served with warm pita chips, carrots, celery and red peppers. Savor these "shrooms" infused with garlic and lightly breaded. Served with our southwestern ranch dressing. A grilled flour tortilla stuffed with Cajun-seasoned grilled chicken, pico, de gallo, and a blend of cheeses. Warm corn tortilla chips served with salsa. Thick-cut onion rings dunked in beer batter then fried to a golden crisp. Served with our southwestern ranch dressing. melted swiss cheese, samuel adams boston lager beer braised mushrooms, and a drizzle of savory house-made garlic mustard sauce. burger topped with medium sauce and a generous amount of blue cheese dressing and crumbles. Big flavor, big everything. We pile hickory-smocked pulled pork, crispy onion rings, cheddar jack cheese and our Honey BBQ sauce on a mouthwatering burger. A beefy burger, Chipotle BBQ seasoning, corn tortilla chips, pepper jack cheese, fresh jalapeños, house-made pico de gallo and a drizzle of southwestern ranch dressing. A beefy burger as only we can serve up. Crispy lettuce, fresh-sliced tomatoes, red onion, and your favorite BUFFALO WILD WINGS sauce or seasoning. An easy win. Our classic burger topped with crisp bacon and your choice of cheddar, pepper jack, swiss, queso, american or blue cheese. Served with lettuce, tomato and red onion. All the flavors you love. Crispy buffalo chicken with rich and creamy aged cheddar cheese sauce, oven-baked with crunchy breadcrumb topping. Grilled, or cooked to order, chicken tossed in our signature Parmesan Garlic™ Sauce, served on a bed of fresh romaine and topped with Parmesan cheese and croutons. Served with light Caesar dressing. pulled pork or grilled chicken breast seasoned with desert heat, served on top of fresh greens, pico de gallo, a savory blend of roasted corn and jalapeños, cheddar jack cheese, avocado and crunchy tortilla strips. Served with cilantro lime ranch dressing and soft tortillas. Fresh greens tossed in light caesar dressing. 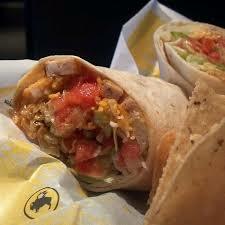 All Wraps and Buffalitos served with Tortilla Chips and Salsa. Sandwiches served with natural-cut fries. Two soft flour tortillas with grilled chicken, lettuce, pico de gallo, a blend of cheeses, sour cream and your favorite BUFFALO WILD WINGS® sauce or dry seasoning. Large flour tortilla loaded with prime rib, pepper jack cheese, fresh lettuce, house-made pico de gallo and our southwestern ranch dressing. 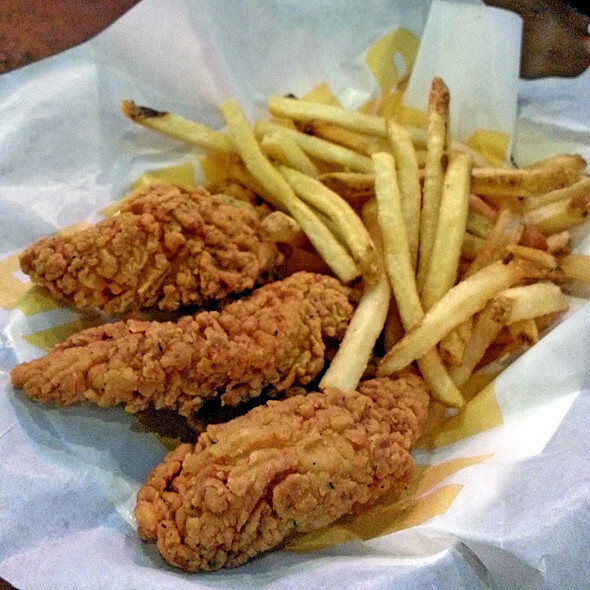 Packed with your choice of cajun-seasoned popcorn shrimp or crispy chicken drizzled with creamy cajun creole sauce. Topped with fresh lettuce, tomatoes and creamy coleslaw. Our hickory-smoked pulled pork is piled high on a toasted hoagie bun and topped with Honey BBQ sauce, in-house pickled red onions and creamy, crunchy coleslaw. chicken breast, grilled and drizzled with our honey bbq sauce, is topped with a classic combo of lettuce, tomatoes, pickles and onions plus pepper jack cheese and bacon. Try one of the three refreshing flavors made with Sierra Mist.